For a very long time, Google has focused on building its own productivity software to serve everyone from consumers to massive enterprises, and then locking people into its core experience. That all changed on Wednesday. The company announced that it’s partnering with Box to let users of the enterprise cloud storage and content services platform edit documents with Google Docs, Sheets and Slides, but keep them stored inside Box. It’s a vast departure from the company’s previous direction, which required people to store files edited with Docs inside Google Drive. Google said that the company is working on turning its Docs productivity suite into an open platform, and is open to working with other storage providers in a similar way. Google Drive will still remain the default storage system for Docs, Sheets and Slides, even as the company pushes its open platform strategy. The move provides security advantages for shared users of Box and Google Docs. Administrators will be able to manage access to documents using the same Box management console that they’re used to, while still letting users work with the Docs suite. It’s also a boon for end users, who will be able to find documents from Google’s productivity suite in the same cloud storage system where they keep other files. In order to use Google Docs with Box, enterprise customers will need a paid Google Apps subscription. Consumers will be able to use Box as the storage service for Google Docs for free. 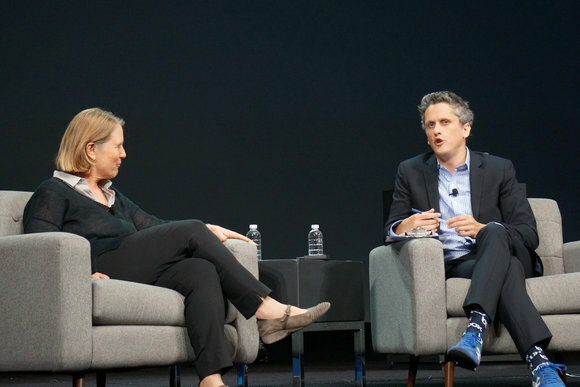 The move is emblematic of Google’s heightened enterprise focus under the leadership of Diane Greene, the executive vice president of Google Cloud Enterprise. Greene has been instrumental in forging partnerships aimed at appealing to large businesses, something that Google hasn’t always succeeded at. Other recent moves have included an expanded partnership with Oktafocused around providing enterprises with identity management services. Google and Box will also work together on making Box content available in Google Springboard, an artificial intelligence-powered assistant aimed at giving employees the information they need from a variety of services, including Gmail, Google Calendar and third-party services like Box. The two companies haven’t said when the fruits of their partnership will actually appear. But the move means that both companies’ products could become more appealing — enterprises using Google Apps might be more likely to subscribe to Box, and vice versa.